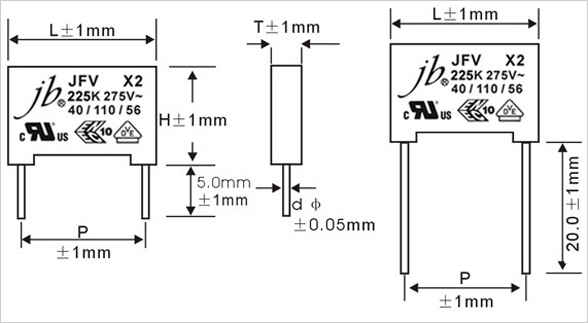 jb Capacitors manufactures X2 Metallized Polypropylene Film Capacitor, which also named Interference Suppression Capacitors or X2 Safety Capacitors, and we sell quite competitive prices. This X2 Safety Capacitor has 3 approval markings: VDE, ENEC and UL. Following are X2 Metallized Polypropylene Film Capacitor features, specifications and drawing. Non-inductive, (UL940V-0) plastic case sealed with epoxy resin. Class X2 safety capacitors for 275VAC. Provides interference suppression capacitor with VDE, ENEC and UL approvals. Short delivery, some items have stock available. High quality commitment, good prices support. Ammo Tape Pack, Cut leads, Long leads are available. Fast sales response for cross, quotation.